muten zum Teil noch sehr urtümlich an, waren aber immer zeitgemäß modern und von je her zuverlässig. Aus dieser ersten Herstellungs-Periode stammen u. a. die Mischluft-Laternen Nr. 201 und die Frischluft-Laternen Nr. 280. 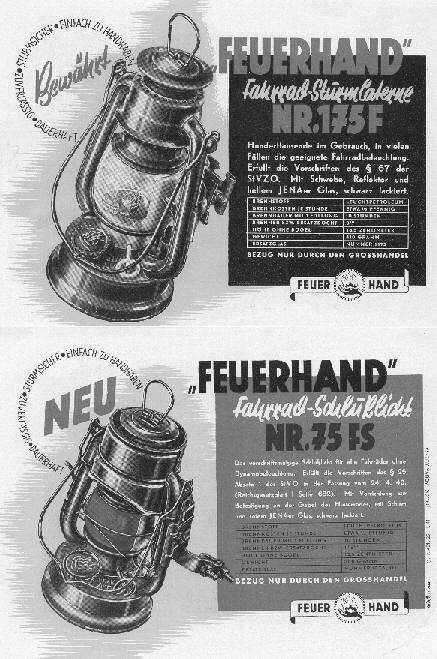 Feuerhand hurricane lanterns were made by the in 1902 founded Hermann Nier factory. they've been ever up to date and reliable. From this periode are also the hot blast lanterns Nr. 201 and the cold blast lanterns Nr. 280. Die Nummern 201, 305 u. 405 wurden noch bis 1941 hergestellt. The Nos. 201, 305 and 405 were still made up to 1941. Die kleinere 270 kann als direkter Vorläufer der späteren Baby-Serie betrachtet werden, sie wurde noch bis ca. Mitte der Dreißiger in modifizierter Form als Nr. 277 hergestellt. The smaller 270 is the Pre-Modell of the later Baby-Series, it was made up to the middle of the thirties in a modified version Nr. 277.
wie z. B. die Nr. 75, Nr. 175 und die Nr. 275. Mischluft-Laternen Nr. 201, Nr. 305 u. Nr. 405 weiterhin gebaut. und auch als Fahrradlaterne und Fahrradrücklicht. during this time the best sold hot blast lanterns Nos. 201, 305 and 405 were still made. Bicycle lamps and bicycle back lights. Die 235 wurde nur bis 1938 hergestellt, ab 1939 gab es die 176E. The 235 was only made up to 1938, from 1939 on the 176E was available. Die Beierfelder Produktion endet 1943. The Beierfeld manufacture ends 1943. Feuerhand-Laterne später auch noch in Lizenz in Indien gefertigt. the seventies the models Nos. 175 and 176 and further the 275 and they still make the 276. 1954 the Nr. 252 were produced once again, later it became the only Feuerhand lantern which was ever made by license under the Feuerhand label in India. During the sixties and the seventies they also made electric road construction lamps, warning triangels and other things. Today they make the 276 as the last hurricane lantern which were made in the western hemisphere and they make a lot of small tin parts for the car industry. Das Model Nr. 275 gabe es auch vorrübergehend mit Sturmkappe. The Model Nr. 275 was also made with storm cap for a small time. Alle anderen Modelle wurden bis ca. 1990 hergestellt, die 276 ohne Sturmkappe wird aktuell als einzige Laterne weiterhin gefertigt. All modells were made up to 1990, the Nr. 276 w/o storm cap is still in production. und bis 1965 auch mit Sturmkappe hergestellt. up to 1965 also with storm cap. von links nach rechts: Type 584, Typ 551, Typ 501, Combi-Lampe, Warnblinker Nr. 30, Blink-Lampe Typ 36. The old factory in Beierfeld becomes in the late fourties the people own firm "hurricane lantern works Beierfeld" as a part of the MEWA metal ware combinate of the GDR. With the old tools of the 275 and 276 which Nier left there they made the BAT lanterns Nr. 158 and 159 after Nier vorbidd them to use the Trade Mark Feuerhand for the GDR made Lanterns.